If you have any questions or want to enquire about dates, use our form to contact Rob & Rachel Hill or see their website for more information. Pheasant strut, shy deer bounce by – sure signs that you’re immersed in the Goodwood Estate. 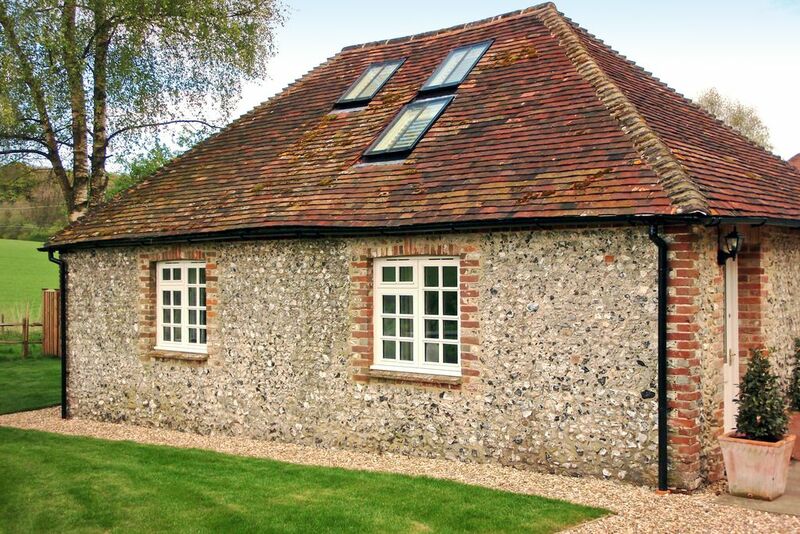 This little flint barn is tucked into one of the most unspoilt woody corners of Sussex. Rush hour here, on a leafy lane, consists of the occasional tractor, car or combine. Renovated and decorated to the highest order – in duck-egg blue with hints of gold – this is one stylish retreat. Downstairs, a luxurious bedroom with a huge bed, silk throws, velvet cushions and a shower room with slate tiles, heated rails and fluffy bathrobes. In the living room, cream sofas, fresh flowers, a Shaker kitchen. Upstairs, a big twin bedroom, a roll top bath, soft lights and white towels. A welcome pack of fruit, ham, cheese, coffee and croissants is provided by the lovely owners who live in the main house – as are binoculars so you can spy on the wildlife! Sit out on the neat little patio through the French windows, enjoy a game of tennis, borrow the barbecue. Or set off for East Dean – it has two wonderful pubs. Sussex at its best, hidden well away yet never far from civilisation: historic Chichester is close by. Special offer: Special Offers: 2 nights £480, 3 nights weekend stay from £575, 4 nights midweek from £575, 7 nights from £750. Dogs welcome. Includes welcome breakfast hamper, Visit www.rubensbarn.co.uk for details. Minimum stay: 2 nights. Short breaks available. Advice on walks and dog-friendly pubs nearby. Dogs £30 per dog per stay. Max. 2. Secure garden, surrounded by walks through forests and farmland. Area of Outstanding Natural Beauty in the South Downs National Park. Have you visited Rubens Barn? Be the first to leave a review. Rubens Barn is the ideal base for hikers, cyclists and nature lovers. The 'Star and Garter' pub is located along a small country lane 1 mile from the barn, and serves excellent food. The Goodwood Health Club is nearby and perfect for a pampering treat. We can arrange temporary membership for guests. Local activities - Tennis, golf, motor racing, sailing, fishing, hot air balloon rides, and wine tasting at local vineyards. Entertainment - Chichester Festival Theatre shows. Festival of Speed and Revival meetings at Goodwood. Glorious Goodwood and regular horse race meetings (May-Oct). Historic interest - Goodwood House, Arundel Castle, Roman city of Chichester, Weald and Downland museum, Portsmouth historic dockyard. Beautiful sandy beaches at West Wittering, famous for windsurfing.